M-Audio's Sputnik delivers the smooth valve sound they intended, and at a reasonable price. Surprisingly smooth, neutral-sounding. Copes with low frequencies well. Great value for money. Not good for dull-on-top instruments. A bit heavy. M-Audio continues to go from strength to strength, and is still upping its game. Its newest products include some fine reference monitors, as well as software instruments, interfaces and of course microphones. So what of the Sputnik? Well, visually at least it looks a bit like their other lollipop microphones, the Solaris and Luna. In actual fact though, it marks a move not only into the mid-price bracket, but also into the valve mic arena. Given the other players in the market, this is a bold move. 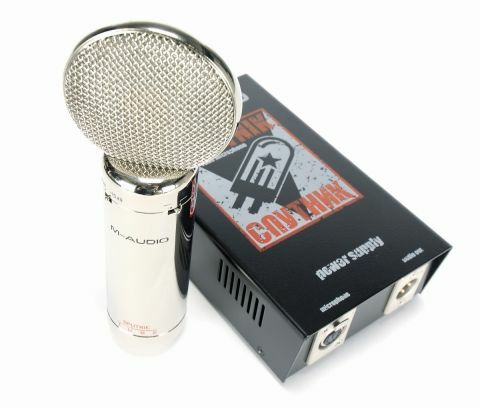 It has to be said, 'Sputnik' is an odd name for a mic (if you want a full explanation check out the M-Audio website). But rather than being Russian, it's actually Chinese-made with a US valve inside. It's a three-pattern design with low cut and 10dB pad. As you'd expect from a valve mic, it comes in a padded flight case, with cradle, power supply and multi-core cable included. The mic itself is housed in a solid brass casing (with nickel polished coating) so it's pretty heavy. The capsule is a dual-diaphragm design, and in addition to the 6025M tube amplifier circuit, the Sputnik also has a handwound transformer output stage. The result is a healthy output (30mV/Pa), and a noise figure that, at 18dB, isn't low, but is par for the course for a valve mic of this type. As M-Audio point out, the idea was to produce something between the AKG C12 (which is quite bright) and the Neumann U47 (which is warm in the lower frequencies). So have they succeeded? First impressions in cardioid mode are that the sound is reasonably flat -- there's no obvious lift in the upper frequencies. Switching through the patterns reveals good off-axis rejection in cardioid and figure eight mode, with the omni mode unsurprisingly flat, even up close. Trying the mic on various sources using the cardioid pattern, it's quite surprising by just how neutral it sounds. The result is that it's really smooth sounding. On acoustic guitar the sound is well balanced, coping with the low frequencies well, and offering a little sparkle on the top. One worry is that, for instruments that can sound a little dull on top (a nylon strung guitar, say), there's not much help there. In those situations it might be best to reach for the EQ or most likely another mic. The Sputnik is up against some pretty stiff competition. Its electronics and ancillary elements bear an uncanny resemblance to the Groove Tubes' GT67. However, the capsule also plays a big role and delivers a very good sound indeed. Although it's becoming hard to distinguish between so many mid-priced valve mics, that shouldn't put you off. This mic is excellent value for money, and suits all sorts of applications perfectly.